Jenny Fung has over 20 years of experience in the financial and banking industry. Currently, she is the Chief Compliance Officer of ABN AMRO and manages the compliance function covering all business lines including commercial banking, corporate & institutional banking, clearing and formerly private banking. 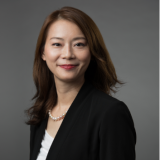 Prior to that, she joined Goldman Sachs as Executive Director of Global Compliance and Standard Bank as Head of Compliance for the Asia Pacific region. In her previous and current roles, Jenny covers the compliance functions of private banking, investment banking, corporate banking, global markets and clearing in various aspects, including advisory, AML/CFT, regulatory governance and affairs, licensing, monitoring and controls, etc. Jenny is a qualified accountant recognised by The Association of Chartered Certified Accountants and Hong Kong Institute of Certified Public Accountant and she started her career as an auditor in Deloitte. She also holds a BA (Hons) Degree in Accountancy, Degree in Laws, Master Degree in Finance and MBA. Check out the incredible speaker line-up to see who will be joining Jenny .